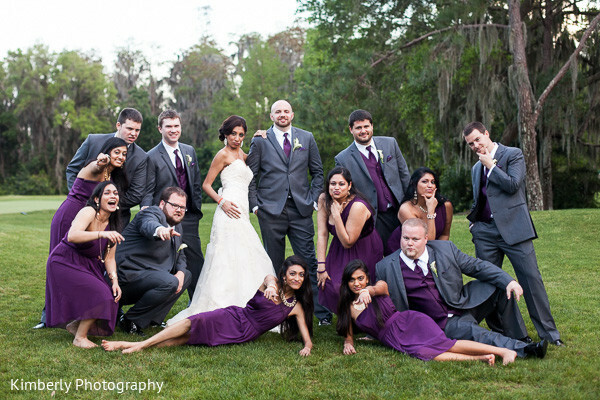 Are you getting ready to shoot a big bridal party? As a new photographer, you may be a bit nervous to photograph your first large wedding party, however there are some tips you can use to make it easier. 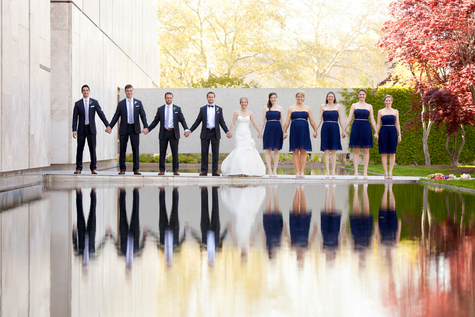 In this article, we will share 9 tips to photograph a big bridal party. When planning your photo sessions with the engaged couple, you need to have a clear schedule for each shot so you don’t miss out any important pose. 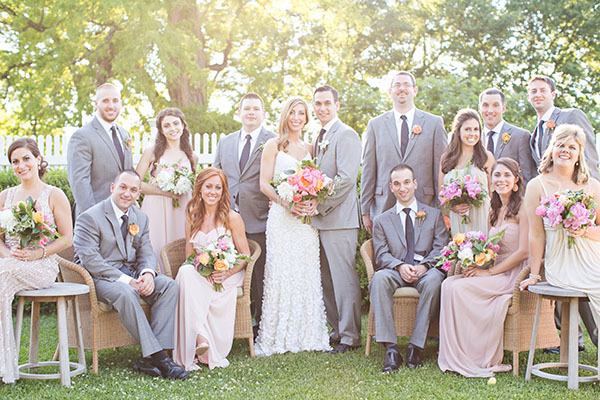 Especially when it comes to shooting a big bridal party, you’ll need everyone to be prompt. Setting an exact time for this shot will help to ensure that everyone is present on schedule. A great time to take the shot is after the ceremony and before the reception. You can even take some shots when the groomsmen and bridesmaids are walking with the couple to the reception area. To compose a balanced shot, make use of any available chairs, stools, or any other available seating in the area. 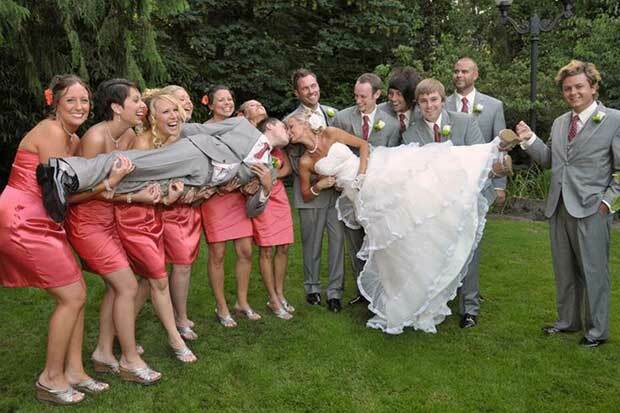 This way, you can let them settle in and adjust the groomsmen and bridesmaids to perfection before taking the shot. A great place to do this is in the reception area, before the guests arrive. Bring an assistant with you to the shoot to lend you an extra hand. Your assistant doesn’t need any special skills… it could be your friend, or even a friend of the couple. Your assistant can help by holding up a reflector or a diffuser to help light the shot. Don’t just settle for a few photos. You should take as many shots as possible to capture all the candid moments like talking, laughter, and unposed expressions. The more shots you have to choose from, the better. Just remember to pack multiple memory cards with you so you don’t run out of space! Outdoor shots are great for bridal parties because you can usually find a spot with nice, even light across all subjects. Just keep in mind that if you are shooting during the afternoon when the sun is high, you should find a completely shaded spot so the lighting isn’t too harsh. For shooting indoors and for backlit shots, make sure you have a flash on hand. While you are focusing on posing each member of the bridal party, don’t forget to look around and take notice of your surroundings. Use nature or architecture to your advantage by pulling it in to your composition, or even having your subjects interact with it. 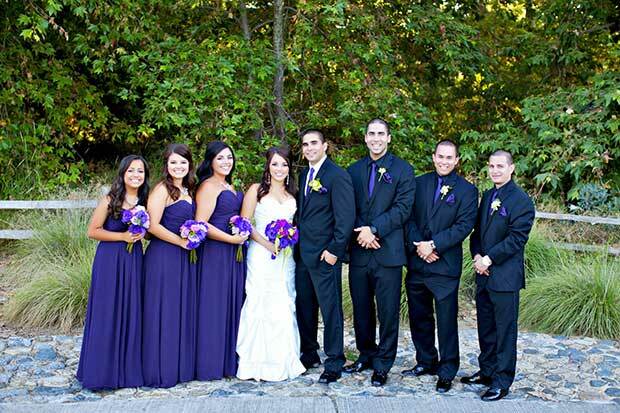 Don’t forget to get a shot of the bridal party together with the couple. This is a great opportunity to have some fun and create a truly memorable shot… get creative, and don’t be afraid to ask for some silly poses. Your clients will love looking back on them! 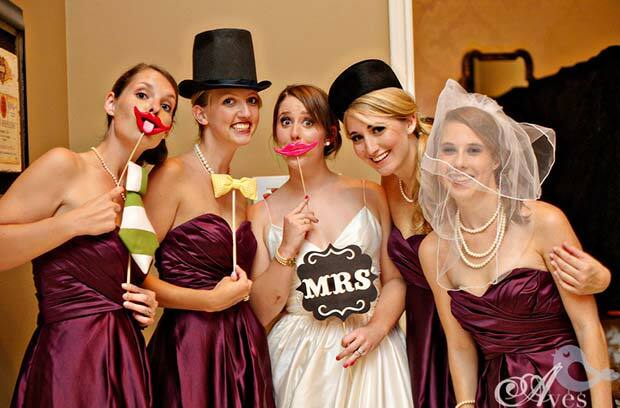 Props are an easy way to break the ice and add more personality to your bridal party shots. A great place to find props is at the reception photo booth. Or, you can surprise the couple by bringing your own props. 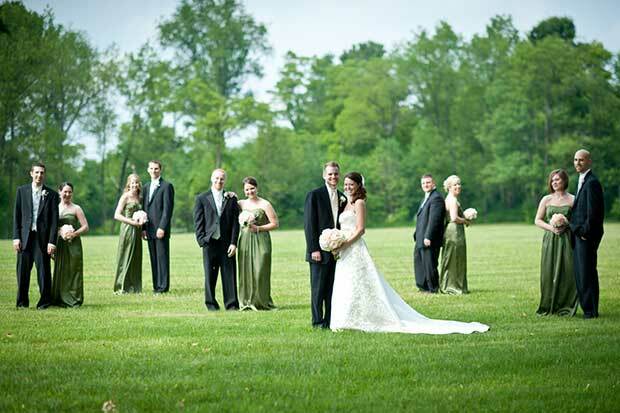 Try shooting the bride with her bridesmaids separately from the groom and his groomsmen. They’ll often be more relaxed this way, and you’ll capture even more personality in your shots. Do you know the top photographers in your area? Why not assist them on some shoots to learn how they handle their sessions? Don’t be afraid to offer your services (free of charge) to a professional wedding photographer. This is the quickest way to learn the techniques the pros use. 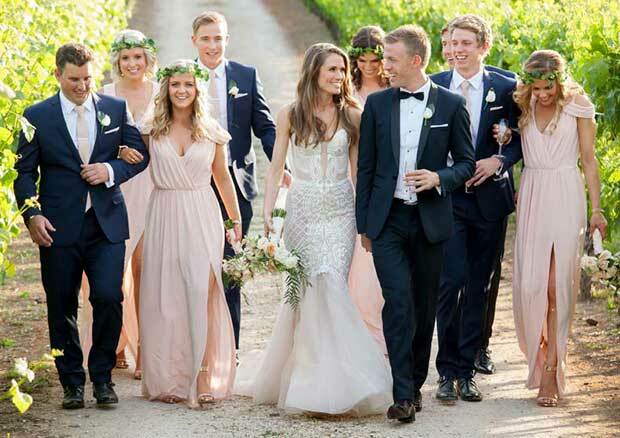 We hope this article has helped you to learn 9 tips to photograph a big bridal party. You may also want to check out our guide on 15 unique & essential wedding photography pose ideas for couples.